In the Battle for Britain series of books renowned historical illustrator Peter Dennis sets the paper soldiers of the 19th century marching again across the wargames tables of the 21st. All the troop types of the wars are represented in full colour in a format designed to create stands of soldiers which can be used to re-fight the epic struggles for the control of Britain. All the artwork needed to make historically accurate armies, using traditional skills with scissors and glue, is presented in a source-book format, copyright free for personal use. 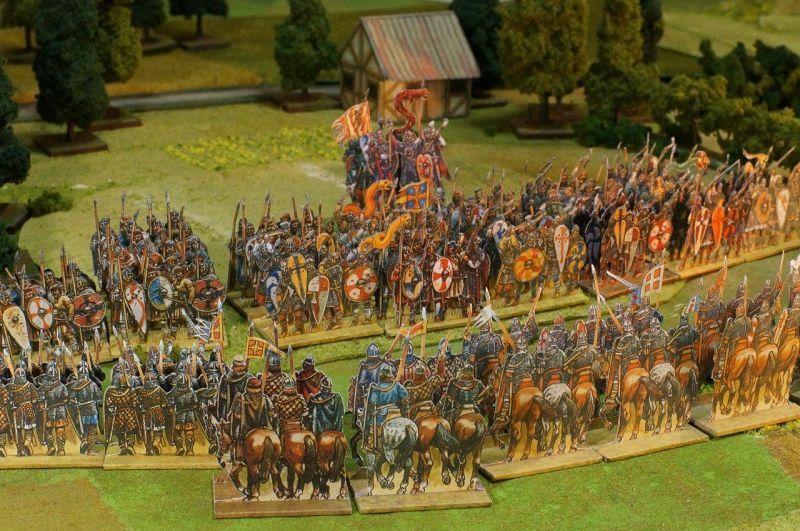 Although the figures can be used with any commercial set of wargame rules, an introduction to wargaming and a simple set of rules by veteran wargamer Andy Callan is included. In this title, the Saxons, Vikings and Normans, can be made, along with buildings, trees and even Viking ships to transport Harald Hardrada’s men to meet their fate at Stamford Bridge.